[ Home ] | [ Submit photo ] Share your Christian photos––Click submit to send your pic in just seconds! 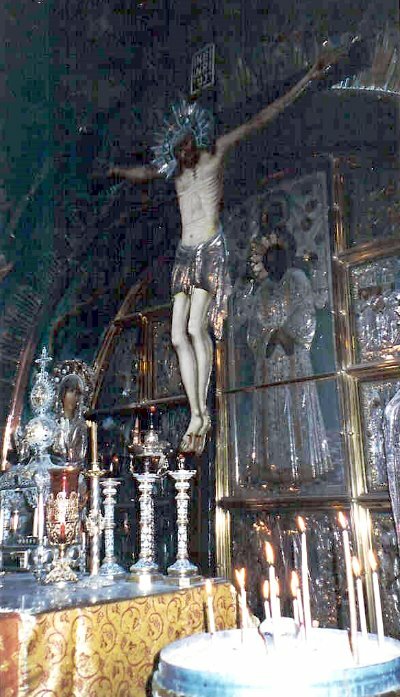 Description: Within The Church of the Holy Sepulchre in Jerusalem, this is the actual spot in which our Lord was crucified. The base of the shrine contains the hole in which the True Cross was fixed. Maybe your photo will be the next featured selection in our online pilgrimage photo album! All rights reserved. Photographs and graphics displayed on this website are protected under CatholicPilgrims.com copyright or rights granted to CatholicPilgrims.com. Copying or distribution without permission is prohibited.